Torticollis, otherwise known as wry neck, is a condition where the head abnormally and involuntarily bends to one side, with the chin pointing to the opposite side and upwards. In other words, it is often related to also as cervical dystonia in the neck although this is another condition. Wry neck can be caused by a physical or neurological disorder that causes intermittent or prolonged muscle contractions that result in abnormal repetitive movement and posture. Cervical dystonia is the most common type of dystonia that results from the prolonged contraction of the neck muscles, particularly the sternocleidomastoid muscle. It should be understood though that although both wry neck and cervical dystonia have similar symptoms, they are both separate conditions that are diagnosed differently. This is usually a long-term form of wry neck that is permanent or acute and is attributed to issues with the structure of muscle and bone around the neck and head. This is a rare form of torticollis and usually, occurs just after birth due to the fusing of bones in the neck vertebrae. This usually affects the individual as they grow up with a higher risk of hearing or ocular difficulties. The most common type of torticollis, this is usually due to scarring. 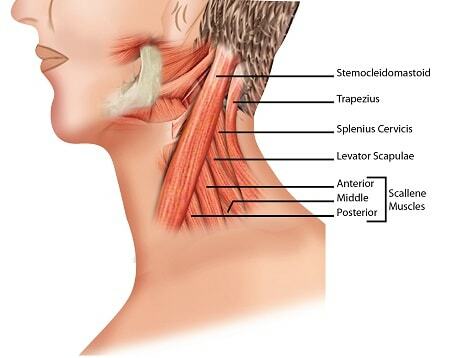 light trauma or tightness of muscles in the neck. Temporary torticollis usually resolves itself within a few days and is usually as a cause of light injury, swollen lymph nodes or an infection around the area. Simple rotary – abnormal rotation of the head in the horizontal plane. This is the most common type of cervical dystonia. Laterocollis – abnormal rotation of the head in the frontal plane. Retrocollis – head pulls back with neck hyperextended and chin raised. Anterocollis – head bends forward with the neck flexed. Development of wry neck after a trauma is rare, but in an athlete it may occur as a defence against further injury such as a muscle strain. There is also a genetic factor that may contribute to the development of torticollis. Cervical dystonia may present as a fixed posture, tremor, jerk or spasm. Wry neck (torticollis) is often underdiagnosed or misdiagnosed as dystonia, and so is generally poorly understood by the medical community. There is no standard diagnostic test for cervical dystonia. 29% of patients with cervical dystonia are misdiagnosed and it can take up to 4 years and multiple visits for a correct diagnosis to be made. One study found the sensitivity of clinical examination to be only 59%, and specificity to be 75% Electromyography is therefore recommended to make an accurate diagnosis on the muscle groups involved and that need to be considered in treatment. Various test and procedures can be done for differential diagnosis, to eliminate other possible causes of head and neck pain. A physical examination will show a head that is involuntarily rotated or tilted to one side, and there may be more than one abnormal head position. The physician may find that the neck muscles have shortened or they may be enlarged. Computerized tomography (CT) scans may be done on the neck, and MRI on the brain to make a differential diagnosis. Blood tests for conditions known to cause cervical dystonia may also be helpful in finding the underlying cause. Botulinum toxin intramuscular injection is considered the first line of treatment for torticollis. Botulinum toxin is the most potent neurotoxin known to man and is produced by Clostridium botulinum and most famously marketed under the brand name Botox, among others. It is effective in alleviating the symptoms and has proven long term effectiveness and safety. Possible side effects of this line of treatment are dry mouth, difficulty swallowing, muscle weakness, local bruising and flu-like symptoms. While oral medications, such as muscle relaxants, can be used alongside with botulinum toxin, their efficacy is limited due to side effects. For persons that do not respond to oral medication and botulinum toxin treatment, surgery may be considered. Possible surgical considerations are deep brain stimulation (DBS) and peripheral nerve denervation. While the former has been effective in treating generalized dystonia, it is inconsistent for cases of cervical dystonia. Mills, R. R., and Pagan, F. L. (2015) Patient considerations in the treatment of cervical dystonia: focus on botulinum toxin type A, Patient Prefer Adherence 9, 725-731. Camargo, C. H., Cattai, L., and Teive, H. A. (2015) Pain Relief in Cervical Dystonia with Botulinum Toxin Treatment, Toxins (Basel) 7, 2321-2335. Brodsky, M. C. (2016) Pediatric Neuro-Ophthalmology, 3rd ed., Springer, USA.